Originally trained on flute, Anne took up shakuhachi in Kobe under Nakamura Shindo, followed by further studies at the Tokyo University of Fine Art and Music under Yamaguchi Goro, and a third lineage under Tajima Tadashi. In addition to recitals, Anne tours to schools nationwide with taiko drummer Toshi Sakamoto. She also presents story-telling shows Kasa Jizo and Omusubi Kororin in primary schools. From 2015 to 2017 Anne was Artistic Director of Tunnel Number Five: festival of underground musicin Darwin, bringing audiences into the resonant WWII tunnels (built following Japanese air raids) in a spirit of creative reflection and collaboration. Anne authored the book Curiosi-tea, spawning theatre shows An AFTERNOON absurdiTEA with Camellia Cha, featuring musicians from Tibet, India and China (OzAsia Festival, Adelaide); and Nonchalant Bombasi-teawith tea master Adam Wojcinski. Anne is featured on many CDs, the most recent recorded in Tunnel Number Five: Beneath the Surface—shakuhachi and violin; Up From the Deepwith Yolgnu songmen. 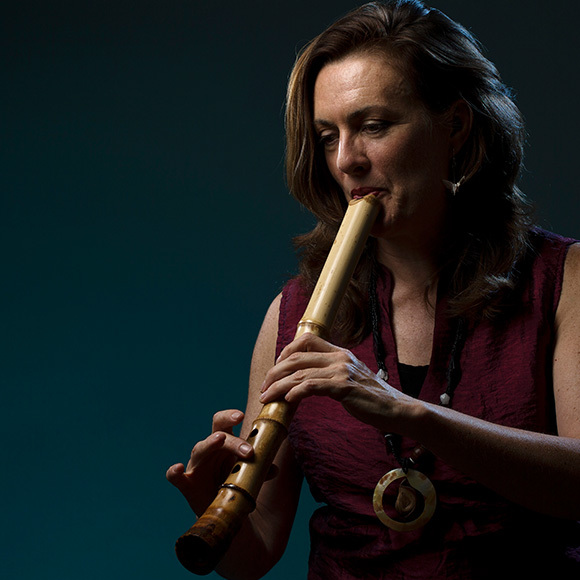 Anne performs traditional and contemporary shakuhachi in concerts and festivals internationally.